After snow melts and leaks into a home, the concern for the homeowner is mold. The latest headache from the deep freeze this winter is one of the worst -- mold growing on and behind the walls of your home or apartment. For the most part, blame those ice dams that build up on the top of gutters, forming as snow melts, refreezes, melts again and refreezes one more time. 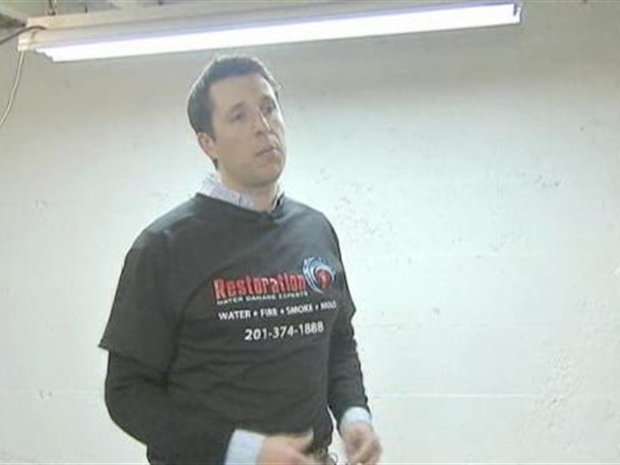 "The water actually has a free pass to go inside," remediation expert Michael McPherson, owner of Restoration 1 NJ told NBC New York at a job site in Dumont. "It runs along the floor and before you know it, you have standing water creating mold, and mold can grow in just a couple of days," he added. NBC New York caught up with McPherson at an office building in Dumont, where an uninsulated water pipe had burst. Mold formed on the cinder block walls. Cleanup will take more than a week and cost the owner or his insurance company thousands of dollars. "You gotta get rid of the water, dry it out," Restoration 1's John Swan said, "then make sure you don't have any live mold spores here." Swan was setting up an industrial-sized air scrubber to draw all of the mold spores out of the air before his crew could scrub the mold off the wall in another day or two. Even after that, the owner of the building bought a small and pricey air-filtering machine to keep in his basement. "What you want to do is, you want to maintain the air quality inside your home," said Joseph Rizzo of Rainbow Cleaning Systems. Or you could start clearing snow off your roof after every storm, and make sure your pipes are insulated to avoid snow mold altogether.